As we head into the high holiday season, we can’t stop thinking about the prospect of cozying up under our favorite quilts after a big family meal. Maybe it’s the temperature drop, or maybe we’re still obsessing over the work of the incredible women of Gee’s Bend, who were generous enough to be our guests at the National Storytelling Festival a few months ago. Whatever the case, we have quilts on the brain—so when we learned about the work of Faith Ringgold, an incredible artist best known for her “story quilts,” we knew we had to share. Every quilt, like anything else that’s handmade, has a story, but the relationship between stories and quilts has always been particularly strong. Sometimes a quilt can represent more of a personal story—a reminder of a person, or a special occasion like a wedding or a birth. Other times it can tell the story of a place. The women of Gee’s Bend, for instance, used to make theirs from worn-out work clothes, which gave the quilts a special tie to the community and its history. Some quilts have even told the story of our country. During the Civil War, women sewed quilts for soldiers, sometimes stitching the pieces of fabric into a flag pattern. Sometimes they’d write messages or poems in ink onto the quilt itself before shipping it off. We read about one Sunday school teacher who printed her mailing address on her quilt so wounded soldiers could start up a correspondence with her and the children. Ringgold’s story quilts do a little bit of all three, touching on her personal experience, the lives of entire communities (especially Harlem, in New York City), and our shared history as a country. The act of stitching the quilt is an ode to Ringgold’s mother, who was a dressmaker and a fashion designer, as well as a symbol of African-American history, in which the craft of quilting plays an important role. She often honors other figures in African-American culture. One quilt pays tribute to Michael Jackson, and she was once commissioned by Oprah to make a quilt as a birthday present for Maya Angelou. Like the quilts of Gee’s Bend, which have hung in fine art museums, Ringgold’s story quilts, which have been purchased by the Museum of Modern art, the Guggenheim, and the Metropolitan Museum of Art, blur the boundary between high art and folksy crafts. It’s a line that used to be rigorously policed. Before she turned to quilting in the 1980s, Ringgold was a painter and an activist who protested the underrepresentation of women and people of color in museums. She turned to quilting as an act of storytelling when she was having trouble selling her autobiography. Unable to generate interest in her manuscript, Ringgold wrote an autobiographically-inspired story on a quilt in permanent magic marker. The quilt pictured here, “Tar Beach,” is one of Ringgold’s most beloved works. (Later, she transformed it into a highly acclaimed children’s book.) It belongs to the Guggenheim. 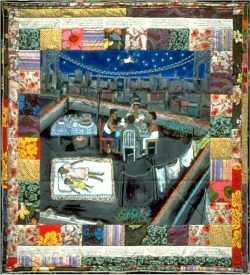 The quilt featured in our newsletter, “Story Street Quilt” depicts a scene from the same New York City neighborhood. Ringgold included elements of folklore from 12 different traditions, representing the major demographics of Harlem residents. The story, which is written in magic marker, captures the life of one character and his family at three different moments in time. His individual story, which is fictional, represents the African-American experience at different moments in history, the experience of Harlem residents, and the experience of black people in America—a curious interplay of the personal and the political. Ringgold sees a strong connection between the way in which a quilt comes together and storytelling, speaking to the way they are “pieced” together. Quilts make for a warm form of storytelling, literally and figuratively, which resonated with Ringgold after years of working as a painter. Painters hang in museums far more often than they hang in people’s living rooms, she says, while quilts are objects that people have an intimate relationship with. Ringgold has been a key figure in elevating a humble craft to the greatest heights of the art world; her work certainly helped pave the way for the national recognition of our friends from Gee’s Bend. (One of Ringgold’s quilts can fetch almost half a million dollars at auction!) The next time you have a few spare minutes, we recommend looking up more of her work online. But be careful—it’s easy to lose yourself (and your lunch hour) in these rich, powerful stories.